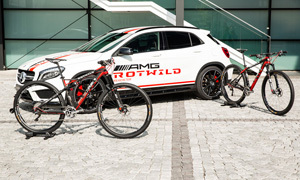 ROTWILD and AMG the sportscar and performance brand of Mercedes-Benz, once again join forces to set up a team for the 2015 mountainbike season. With Sofia Wiedenroth, Nadine Rieder and Stefan Kudella the team now has wider range, covering a greater variety of racing categories. The athletes will not only compete in the UCI MTB Worldcup, but also in other national and international events, the Bundesliga as well as Enduro and Marathon races. In 2015, the AMG ROTWILD MTB Racing Team will again collaborate with the indutry’s top brands. Every partner is ultimately dedicated to racing, engineering and performance. Apart from AMG, the team is also supported by Brose, Continental, Shimano, DT Swiss, Ergon, Topeak and Adidas Eyewear. The professional application in competitive racing delivers valuable input to product development for all partners enabling continued improvement. The mobility of the team members is also well taken care of, as the athletes dynamically take to the road in their Mercedes-Benz GLA 45 AMG vehicles. The team continues to be completed by Canadian Richie Schley The ROTWILD brand ambassador will tour a select number of international mountainbike events.